We recently compiled a comparison of the best Netgear vs Linksys routers. So, we thought it was time to compare the best Netgear vs Asus routers that are are currently ‘hot’. Ok, so let us get on with it. After all, that’s the reason why you are here! Here are the best routers from both Asus and Netgear. 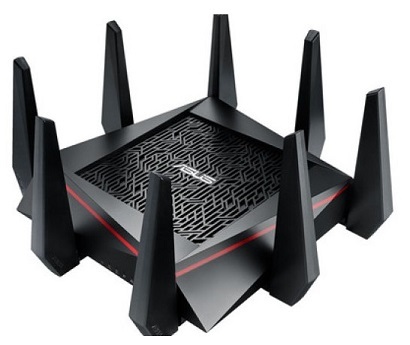 The Netgear Nighthawk X8 R8500 AC5300 Tri-Band router was launched at the tail-end of last year. It’s the follow-up to the ever-popular X6 R8000 which came out a year before that. The X8 is a bit of a beast to say the least! Tri Band and MU-MIMO under one roof….what’s not to like! Up to 5.3Gbps – Yes, you read that right: Five Point Three Gigabits per second. Now that is fast. Yes, yes, they are theoretical speeds (2x 2.167Gbps on 5GHz, a further 1Gbps on 2.4GHz). And yes, you can’t go any faster than 2.167Gbps for any one client. The reason being that the 5.3Gbps is cumulative over three (Tri) bands. So when you connect to one of the bands, and let us assume this is one of the two faster 5GHz bands, it means the client can only go as that particular band allows. But still…5.3Gbps…wow! Tri-Band Wi-Fi – The days of dual band dominating the airwaves (no pun intended) are over. Tri-Band routers have been making plenty of appearances over the last year or so, and they are here to stay. In fact, they will undoubtedly outnumber dual band in due course. Anyway, as already mentioned, both the X8 and the RT-AC5300U use Tri-Band wireless. USB 3.0 & USB 2.0 – Annoyingly, both routers can only muster up one USB 3.0 port each, with a 2nd ‘token’ USB 2.0 port. This might be enough for most people, but still…is it too much to ask for dual USB 3.0? 1.4GHz Dual Core Processor – Both routers have a 1.4GHz dual core processor to handle what is thrown at it. Link Aggregation – Have you got a NAS box? If it supports port bundling, then so does your router! Both of these have the link aggregation feature, where you can connect two single devices with two Ethernet cables. This doubles throughput and helps with resilience. Ok, so the resilience part is something you would see used at a datacenter, to connect a highly important server, but it’s good to have regardless! MU-MIMO Ready – MU-MIMO, just like Tri-Band, seems to be the order of the day. Great for multi-client networks. The router can apply MIMO technology to more than one client at a time…bolstering throughput speed. Both come as MU-MIMO ready. The X6 R8000 has been around for a while now – seems only like yesterday when we first looked at it! AC3200 Wifi – Up to 3.2Gbps wifi (theoretical). Tri-Band – Uses 3 bands for wireless connections. Dual Core CPU – Helps to keep things running smoothly. USB 3.0 & ReadyShare – USB 3.0 (& USB 2.0) ports. Combined with Netgear ReadyShare, it helps to share your files around the home becomes quicker and easier. Netgear GENIE – Maintain and configure your X6 with this smart app, on your tablet, phone or laptop. NitroQAM – AC3100 – This Dual Band beast has combined data rates up to 3.1Gbps. MU-MIMO Ready – With MU-MIMO, multiple wireless nodes can enjoy MIMO speed and efficiency. Free WTFast Account – For those of you who are gamers, you can enjoy WTFast for free (limited features – although you can upgrade). WTFast uses an ‘optimized network’ to help you get along better with your online games. Port Bundling – Connect 2 Ethernet cables to one wired client, doubling throughput. Especially useful for servers and NAS boxes. Adaptive QoS – Get the most out of your network, by making sure fragile, but important traffic types, don’t get affected by others. 1.4GHz Dual Core CPU – Powerful processor. Because the X6 has been out a little longer, and it doesn’t have MU-MIMO (although it does have Tri-Band) it is a little easier on the wallet (at time of writing). Both these routers are solid though. Been around for years now, but it’s still a strong seller (partly due to the fact that the price has come down so much). Like what the R7000 is o Netgear, the RT-AC68U is to Asus – an ever-popular favorite, that refuses to die! Yeah anyone can download and compare specs. That’s why God invented tabs on browsers. Where is the review/comparison/verdict? This is just click bait. A year 10 student could have (and probably did) produce this in about 15 mins.